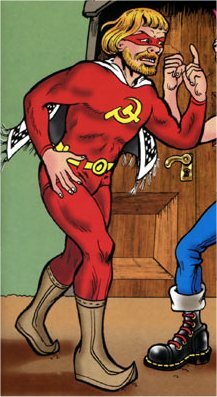 History: Den Maskerade Proggaren was given superhuman powers by the ghost of Karl Marx. Comments: Created by David Nessle. Thanks to Fredrik Åberg for informing me of the character and Hans Holm for providing information on him. Hans notes that "His career stretches at least into the early eighties - the latest given date is 1982, but other adventures were clearly in the early seventies. Girlfriends before Herta (but after he got superpowers) include Lisa Lönn och Lina Lång. Octavia Sandberg, Jarl's mother, spent a period as an enemy when an experiment resulted in her being controlled by her most basic and primitive instincts: her maternal instinct. She also has Doctor Octopus-style tentacles attached to her spine (in fact, she looks a lot like a female Doctor Octopus).